You are here: Home / Increase IP value / To Sell or License your IP? How to determine which, if either, route is best for your business? 2011 was a seminal year for sales and licensing of IP, and for the first time IP deals featured on a regular basis in the mainstream business press. Microsoft and Apple purchase 880 Novell patents for $450 million. Google acquires Motorola Mobility (and its 17,000 patents) for $12.5 Billion. The next era of IP monetisation – the sale of a freestanding covenant not to sue may signal a popular new strategy for monetising patent assets. Google buys 1000 patents from IBM. Apple, Microsoft, RIM et al, buy Nortel’s patents for $4.5 Billion. Oracle sues Google for $6 Billion over alleged Android infringement. Whether or not we just witnessed “the great patent bubble of 2011” does not really matter; since ‘2011’ helped socialise the concept of patent management and monetisation into most boardrooms! However I believe that the world has moved on to the extent that activist shareholders have recently forced boards to consider selling their patents for example at Motorola Mobility and Yahoo. Note: This article will primarily focus on patents since they are the most actively traded and licensed of all forms of IP. scarce and shareholders nervous? By increasing understanding of IP within the business, companies can explore the full range of techniques available to maximise the potential of these assets, such as sale or licensing, comarketing and joint venturing. The question is where and how to start? etc. Probably about 50% of EU companies have audited their IP and a similar percentage has a current plan for their IP . In good times when cash is plentiful it is easy to understand why a busy IP department might choose simply to renew existing rights rather than conduct a thorough and often time-consuming audit. the company or missed opportunities for out-licensing or cross-licensing with appropriate companies. Companies need to ask themselves: which rights in my portfolio should be pruned? Am I paying unnecessarily high rates to licence-in technologies? Which patents can I sell or license for profit? Could merger or acquisition (M&A) fill a technology gap? They should also be comparing themselves to their competitors by asking: what are the innovation trends in my industry? Who are the emerging and fading organisations and inventors in my industry? How does my portfolio compare? use. Non-core rights, on the other hand, relate to registered IP that is of lower value to the company, but could be useful to someone else’s products or services. awareness by providing a tangible link between IP and business outcomes. middle and in the future could go either way. See the diagram below. When Procter & Gamble discovered that only 10% of their 33,000 strong patent portfolio was connected to key business lines it set about selling and licensing the remainder of the portfolio. The outcome of this exercise has been a net reduction in R&D expenditure, an increased percentage of external IP in new products and a continued growth and success of the business. renewal fees; but all without impacting on their €480m of annual patent licensing revenues! attractions to some of the world’s major corporations as it enables full realisation of the value of the asset immediately and in one transaction. willing and able to commit human and financial resources to a legal process. Litigation can be a time consuming and even risky process with many patents being found invalid when challenged in court. strategy has been practiced successfully many times e.g. by the InterContinental Hotels Group. licence to vendors, enabling them practice the IP, maintain any existing business streams connected to the IP and protect against any potential future litigation. third party who may or may not subsequently pursue a licensing / litigation route is an increasingly attractive option, as this avoids direct conflict with such ‘stakeholders’. patents are worth very little. In deciding which assets to market, many businesses find it easiest to identify the non-core weak assets, since these are also the assets they would consider abandoning; essentially their ‘garbage’! Not surprisingly it is quite rare for one businesses’ non-core, weak assets to be another businesses’ treasure! will be even more demand. 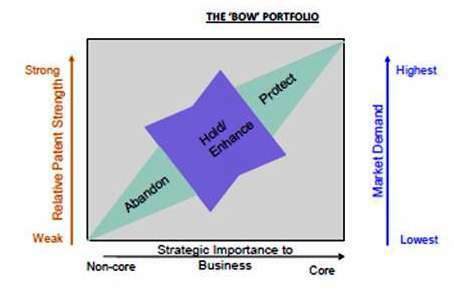 used in defence or offence to protect business lines and / or they are exercised to realise value in the open market. More and more businesses are opening up to the Procter and Gamble approach to IP asset management of ‘being open for business’ in trading these assets in and out, both from a licensing and sale perspective. Licensing is a more traditional route to monetisation, however outright sale (often with a grant back licence) is increasingly popular as shown by the significant and highly valuable deals in 2011.
process consult a well qualified and experienced IP strategist who will be able to guide you through the various options and hopefully help you conclude a successful and value adding transaction.